Garage for car enthusiast is not only a roof for cars, but also a place where we have to spend a lot of time: it is necessary to embellish the body, oil change, and even to engage in serious repair. That’s why the rational layout of the premises and reasonable organization designated to carry out the necessary works are not in last place most of the owners of covered Parking spaces. The magazine discussed this topic. 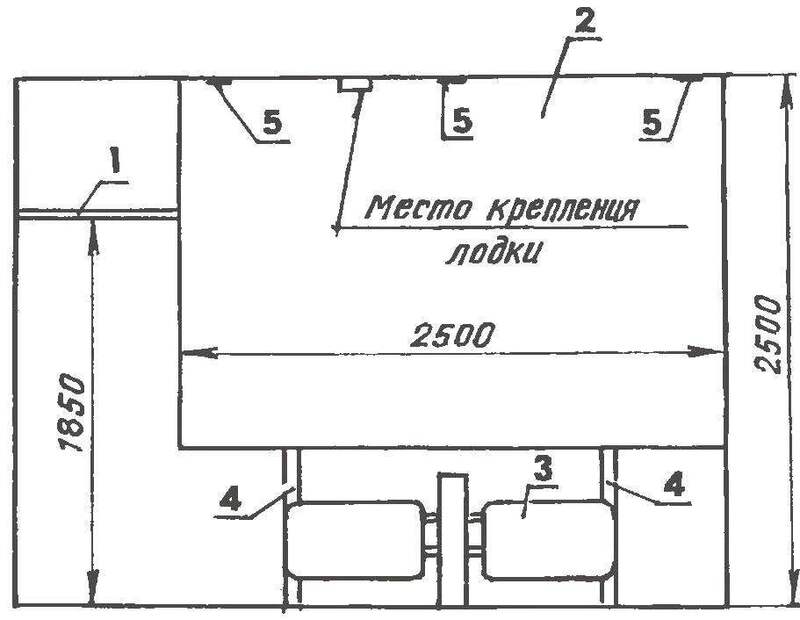 Thus, in the N° 2 in 1987 published an article Lazarev A. experience in the use of hand hoist during repair operations. Today, the editorial staff returns to this theme and offers its readers an article by A. Godyna from the city of Astrakhan. When planning the garage before its construction is necessary to provide for the possibility of repairs including those related to the dismantling of the engine So the floor of the garage preferably does not hold, and accessories, shelves and cabinets with spare parts, materials and tools would be good to place on walls or hang from the ceiling. 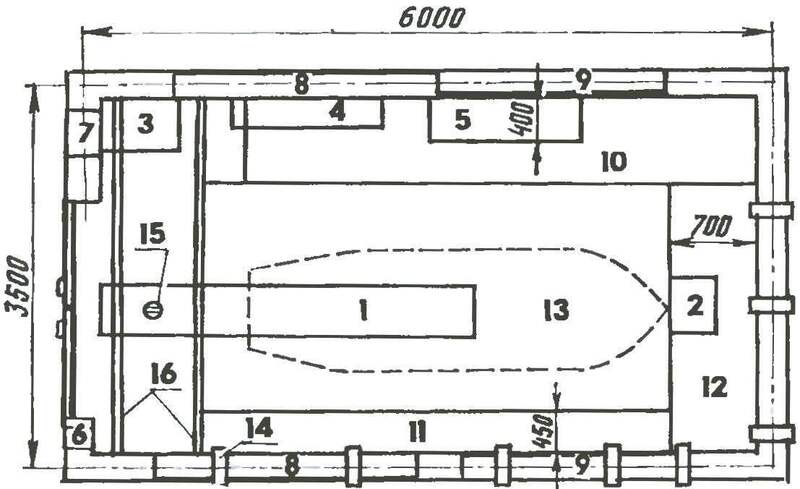 Figure 1 schematically shows a plan of the garage with the rational use of internal space. Here, first of all struck by the shift gate to the right to expand the free floor space left, and the replacement of each of the side brick walls on two niches, made in the form welded frames out of channels and closed with a steel piste. In agreement with the neighbor at the garage one of the two niches is open to the owner, and the second to a neighbor. 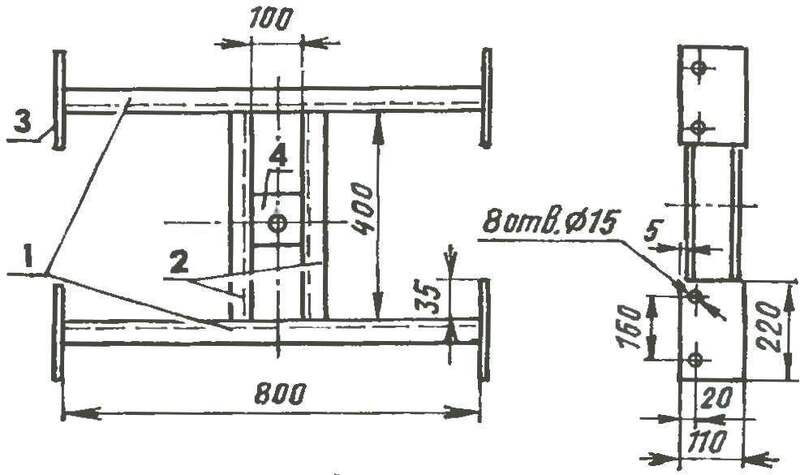 A project in the garage above the door opening provided for a regiment of two steel angles 75x75x8 mm (POS.16 figure 1), embedded in the side walls there is an opportunity instead of shelf to set on the corners of the cart (Fig.2) which console mounted hand hoist, as proposed by A. Lazarev (“modelist-Konstruktor”, # 2, 1987). The design of the trolley is the frame (Fig. 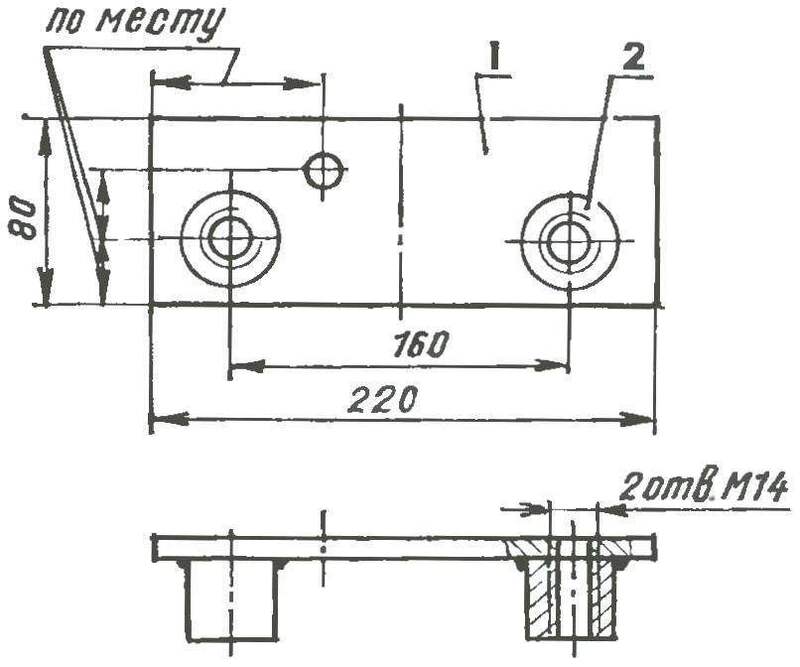 3), welded steel channels № 10. In the center of the frame welded plate 100x100x30 mm with hole for mounting rotary node of the console. 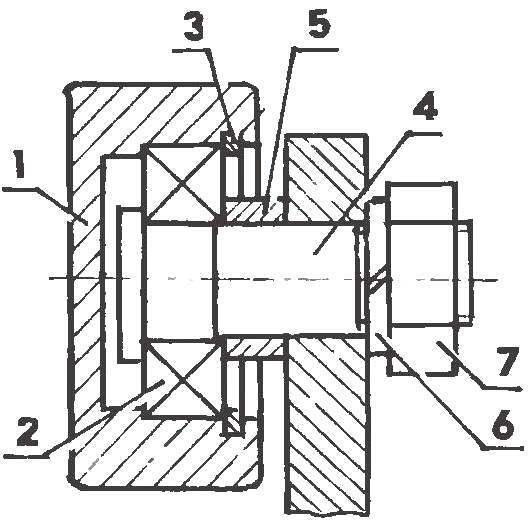 The edges of the frame is welded flange with four holes for fixing the wheel blocks (from written-off hoists), and brackets, which, in turn, mounted on one roller. The last contact with the bottom surface of the shelf area and prevent the overturning of truck. Wall cabinets and shelves in the garage are connected by welding embedded plates, which are installed during construction. 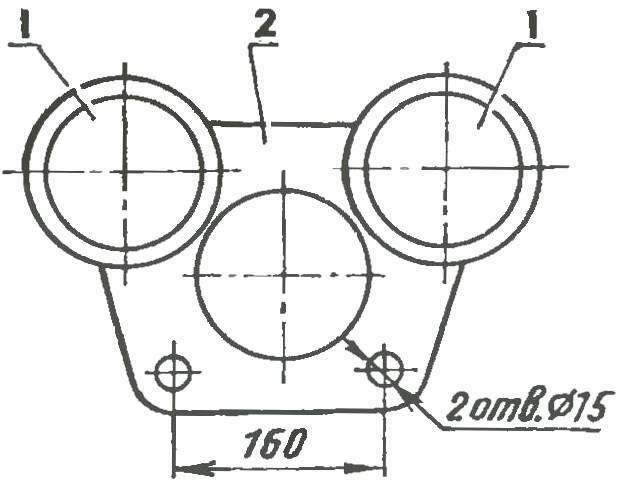 Figure 8 shows one of these plates. 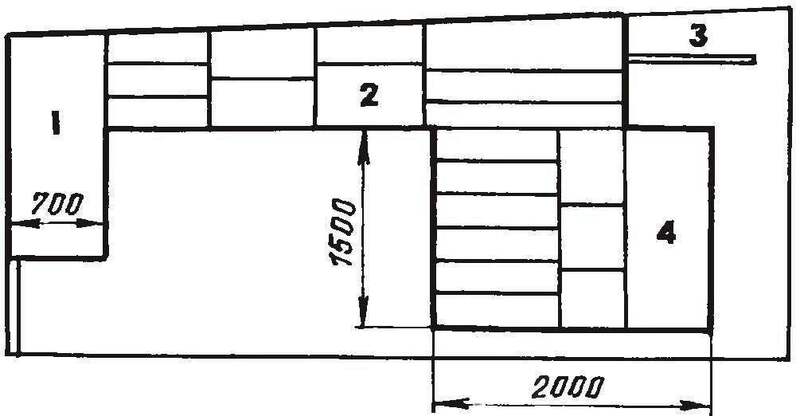 The arrangement of the garage shown in the pictures. 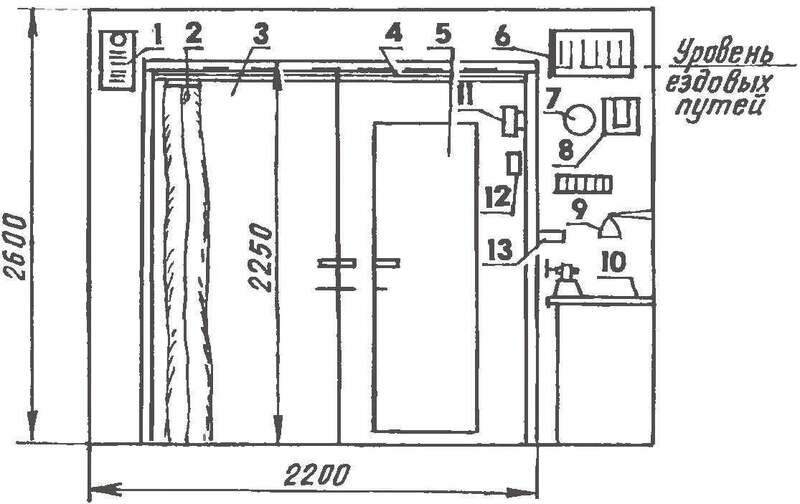 To the back wall (Fig.6) is adjacent to a shelf for the wheels, wall-hung wardrobe. Bottom edge of Cabinet needs to be above the hood and trunk of car is not less than 100 mm. Under a Cabinet, it is advisable to mount the electric heating device having a small thickness. 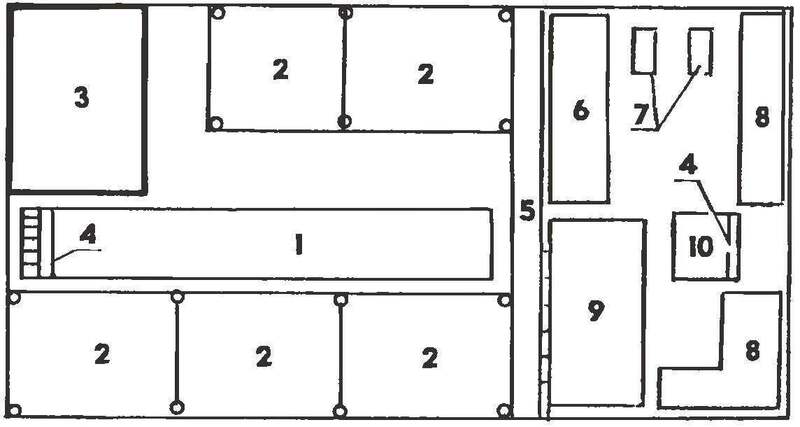 Placement of equipment from left and right walls are shown in figures 9,10, respectively, and a front wall with a gate — on figure 11. 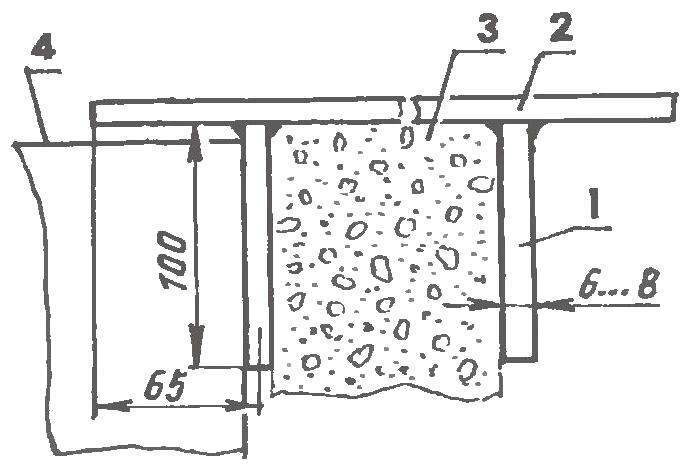 The basement (Fig. 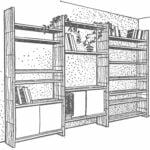 12), except the function of garage spaces (pit, racks for materials), performs an important economic function for storing vegetables and even growing mushrooms. 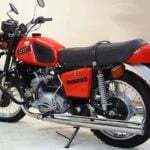 Of course, each motorist layout of the garage, the opportunities of car maintenance and household needs — their own, but something is described can come in handy. From the editor. In accordance with the General requirements safety lifting equipment (in our case, trolley hand hoist) must have a brake or locking mechanism. The simplest retainer is a removable brake Shoe set under the truck wheel. Note also that the use of four pairs of wheels from the hoist irrational. Enough to install on the bogie frame four wheels.